I am very happy to be able to present to you one of the best Christmas singles of the year, at least, in my humble opinion. Not only that, but here is also one of the first places where you can hear both tracks of the single. The single is by Whyte Horses, a band that, up until a few days ago, I was unfamiliar with. I don’t understand how I was able to miss their 2014 7” single ‘The Snowfall’, a beautiful, nostalgic sounding psychedelic song, that is right up my alley. Mastermind behind Manchester-based Whyte Horses is Dom Thomas. Dom is one of the founds of Finders Keepers Records, alongside Andy Votel (formerly of Twisted Nerve Records and also known as a musician) and Doug Shipton (formerly of Cherry Red Records). Finders Keepers was responsible for one of my favorite Christmas 45s of 2016, the version of ‘Silent Night’ Graeme Miller and Steve Shill did for the 1980s children's series The Moomins, that was beautifully packed in a sleeve that felt as if it was made of felt (ha, that sounds funny!). All those involved in Finders Keepers are fanatical record collectors, especially of those records absolutely no one ever has heard of, from the most obscure places in the world. Many of those records they have rescued from dampy cellars in forgotten villages somewhere in the middle of nowhere are re-released on Finders Keepers, so that other people can also enjoy these obscure treasures. Whyte Horses first started out as an image in Dom’s mind. An image of a girl band playing in a Mexican church (probably in one of those small villages I was just talking about). That was in 2011. But an image is only an image, so Dom decided to bring this image to life. First teaming up with Jez Williams of Doves, and later with Julie Margat (who records as Lispector and is originally from France), Dom started to work on songs, with this image still in his mind. When Dom and Julie had written enough songs, they gathered some befriended musicians (Ali Moretti on bass and Owen Matthews on drums), and off they went to Frisinone in Italy, to record those songs in a surrounding that was maybe not a church in Mexico, but had an atmosphere that was much closer to Mexico than their own grey and rainy Northern English surroundings. ‘The Snowfalls’ (also featuring Jez Williams on guitar) and its B-side ‘Morning Clouds’ were the first two songs they released of that recording session, on a 7”, and it was followed in 2015 by the full length, ‘Pop Or Not’. Whyte Horses released the album themselves, on a limited edition LP, with only 300 copies pressed, of which 100 came with a special Mix CD-R, that featured a mix made by Dom, featuring all kind of influences that the band had used in their songs. And these influences were wide, as could also be heard on the record. And yes, it did have some pop songs, cleary influenced by 1960s psychedelic pop, but much more than only pop songs – so the title of the album was very well chosen. An album so special it deserved a wider release, and in stepped UK label CRC Music, that re-released the album in 2016, on both vinyl and CD. Dom doesn’t consider Whyte Horses a band, more a project, and, typically of projects, the people involved change from time to time. For example, in 2016, Dom recorded a new version of the album, now with St Bart's Choir, a choir of children aged 6-11, redoing all the vocals. 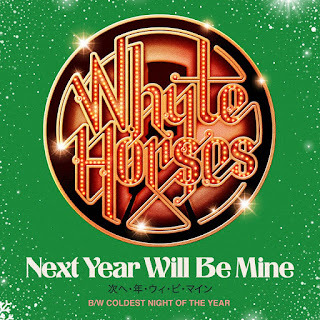 And Whyte Horses did several shows, in places like the Barbican Centre and the Royal Festival Hall, both in London, with many other musicians guesting, like La Roux, The Go! Team, Badly Drawn Boy and Melanie Pain. Whyte Horses released their second album, again on CRC Music, ‘Empty Words’. And now, label and band have a Christmas present for us – a Christmas single, that is released digitally today, December 1st, and will see a 7” vinyl release in three weeks, on December 21, 2018. The A-side of the song is ‘Next Year Will Be Mine’, and is written by Dom. It starts out like a song that could have come straight from Phil Spector’s Christmas album. It is the kind of song that really shines with positivity and hope. After the almost three minutes that the song takes, the Grinch in you has dissolved in the air, never to be seen again. Well, at least, not for the next couple of hours. It has the sleigh bells. It has the sweet female vocals. It has stockings, children singing and the same old (Christmas) songs on the radio. And it has the uplifting lyrics. ‘Come on forget about last year! Let in the sun and the blue skies they will appear’. But what I especially like, is that the lyrics also acknowledge that not everything is perfect, that things go wrong, and you sometimes feel bad. But the main message is that you can do something about it – you, and no one else! It is a song that empowers, and makes you singalong: ‘I’m drawning a line. the next me is here! Next year will be mine!’. Or, to quote Dom: “I like songs about the passing of time, patterns of life and the human condition. We all need a bit of hope going into the new year and 'Next Year Will Be Mine' tries to paint that picture. The beauty is it can be sung at the end of next year if things don't work out." The song is sung by Lucy Styles and Natalie McCool. Lucy is a vocalist from Liverpool, who started experimenting with music at 15 after she was given a computer, sound module and a keyboard by Orchestral Manoeuvres In The Dark´s Andy McClusky. She has already lend her vocal abilities to bands like the Arctic Monkeys and, of course, OMD, she also works as a song (co) writer and is now focusing more and more on creating her own songs. Natalie is from Cheshire, is also a songwriter (she won a national songwriters competition in 2015 and even received a one-to-one songwriting session with Paul McCartney, when she was at University) plus a multi-instrumentalist, who released her debut album in 2013, and followed it up in 2016 with The Great Unknown. The voice of the two ladies fit so well together that you will barely notice that it is not the same singer who is singing the song and doing the harmonies. If you turn the record around (or continue to the second song of the single, if you are listening to the digital version), you’ll find another song to treasure. This time a cover song: in line with the Snowflakes Christmas Singles Club format (original on A, cover on B). 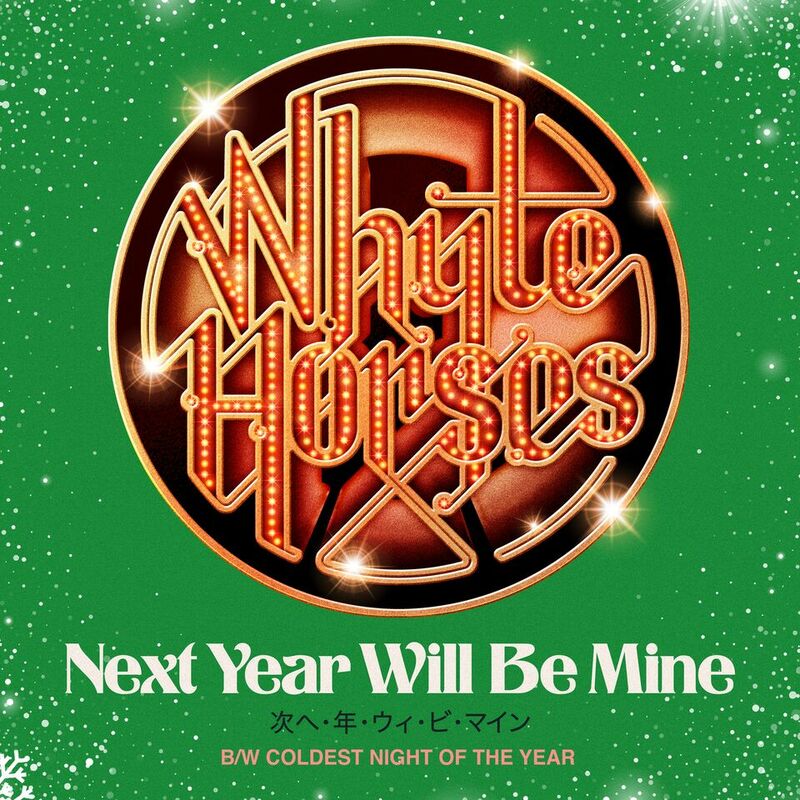 To quote the press release: ‘Coldest Night of the Year is a cover of Vashti Bunyan’s circa.1960’s classic which pays homage to the original but with lashings of Whyte Horses’ magic. The soaring chorus melts away the heartache and turns the song into one which captures the wonderful bittersweet feeling of the longing for loved ones at this time of year.’ It is a beautiful version of a beautiful song. That was indeed recorded by Vashti Bunyan in the 1960s, to be precisely, in 1966. She recorded it as a duet with the British duo Twice As Much. Twice As Much had hits like ‘Sittin’ On A Fence’ and ‘True Story’. The song was intended for a single, which, unfortunately, never saw the light of day. A shame, because it is a classic. But this is not the complete story of this song. ‘Coldest Night Of The Year’ was composed by American songwriting duo Barry Mann and Cynthia Weil. Barry and Cynthia, who married in 1961 and are still together, were responsible for many many hits from the early 1960s on. 'On Broadway' (The Drifters)? 'Walking In The Rain' (The Ronettes)? 'Saturday Night At The Movies' (The Drifters)? 'You've Lost That Lovin' Feelin' (The Righteous Brothers)? 'We Gotta Get Out Of This Place' (The Animals)? ‘I Just Can't Help Believing’ (Bobby Vee, and later also Elvis Presley)? Yes, all compositions of the two. ‘Coldest Night Of The Year’ was originally recorded by the brother-sister duo of April Stevens and Nino Tempo, and was released as the B-side of their early 1965 single ‘These Arms Of Mine’. Almost two years later, in October 1966, the song was released as A-side in the UK for the 1966 Christmas Season. If that release is the reason why the version of Vashya and Twice As Much did not get its single release, I don’t know, but the version of Vashya and Twice As Much does sound much more like a Christmas song, with subtile bells in the background, than the rather straightforward sounding version of April and Nino. The theme of the song is comparable to that of ‘Baby It’s Cold Outside’ – it’s cold outside, and although he should go home as it is late, it is so cold that it does not feel right to her to send him home, to sum it up in one sentence. Main difference is that in ‘Baby It’s Cold Outside’ the man really tries to seduce the woman, so he can stay, while in ‘Coldest Night Of The Year’, he says he has the flue, so he can’t really go into the cold; and it is more clear that this is totally okay with the woman, who sings its better to cuddle up instead of sending him out into the cold storm. The version of Whyte Horses is indeed much closer to the Vashti/Twice As Much version than to that of version of April and Nino – with the main differences that this time, two women are singing the song, as, again, Lucy and Natalie share the vocals – and again, you probably wouldn’t notice, if you did not know. The single can be ordered from the website of the label CRC Music (here), or, if you prefer a digital version, or can’t wait until December 21, through all the known digital channels. Of course, after such a long read, you are eager to hear the songs. Well, there you go! Thank you for the inspiration and encouragement!